Château de Chantilly, set on a rock in the otherwise flat, marshy valley of the Nonette River, was first fortified in Roman times and was in continuous occupation throughout the Middle Ages. In 1386 it was bought by Pierre d’Orgemont, Chancelier de France, who built a new castle that was completed in1394 on the site. 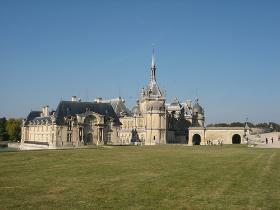 In 1484 Chantilly passed to the Montmorency family. In 1524 remodelling of d’Orgemont’s castle in a French Renaissance style was begun by Anne, Duc de Montmorency and Constable of France under Francis I, Henry II and Charles IX. Work was interrupted by the capture of the Constable at the Battle of Pavia in 1525, but was resumed after his release. Between 1528 and 1531 Pierre Chambiges completed the reconstruction of the north and west wings and construction of the Galerie des Cerfs which formed one end of a walled garden. The name derived from the many life-like stags’ heads that adorned it: they were carved in wood with real antlers and all bore on their necks the arms of Montmorency and the families with which they were allied. 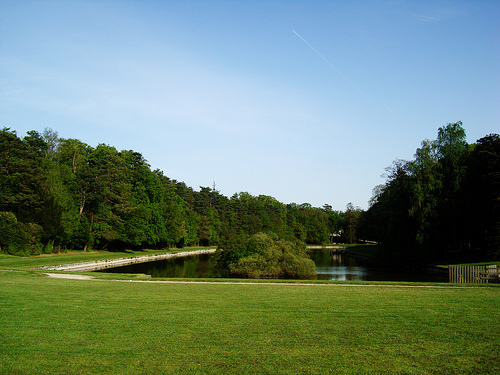 In May 1538 a contract was made with Jean Chocquet, a master mason of Senlis, to construct the great terrace between the château and the park. This was an important step towards regularizing an otherwise irregular design. A new, smaller castle, the Petit Château, was built in 1560 in proto-Baroque style on its own island in the moat but connected to the main château by a bridge. 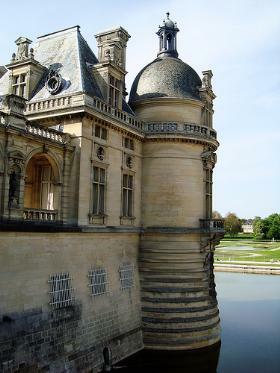 Although there is no record of the architect, it was probably designed by Jean Bullant, who was in the service of Montmorency between 1550 and 1567 and had worked on his châteaux at Ecouen and Fère-en-Tardenois. 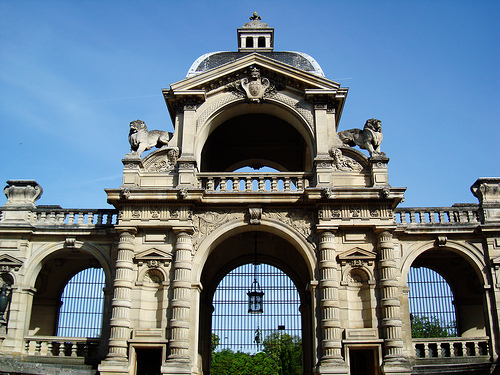 Chantilly housed the Constable’s art collection, which included Michelangelo’s two white marble Captives (currently at Paris, Louvre), made for the tomb of Pope Julius II in S Pietro Vincoli, Rome, and many notable antiquities. On his death at the Battle of Saint-Denis in 1567, Anne de Montmorency was succeeded by his son Henri (1534–1614), who completed his father’s work at Château de Chantilly between 1600 and 1614. As the centrepiece of the great east terrace Henri erected a statue of his father (destroyed during the French Revolution, but replaced by a bronze equestrian version later). His son Henri II de Montmorency built a house in the park, the Maison de Sylvie, named after his wife. 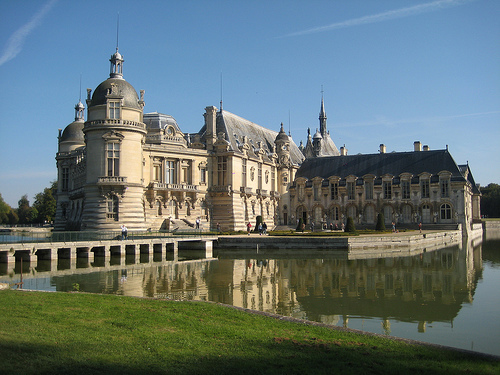 Chantilly then passed to Louis II, Prince de Condé (1621–1686), the son of Henry II, Prince de Condé, and nephew of Henri II de Montmorency. 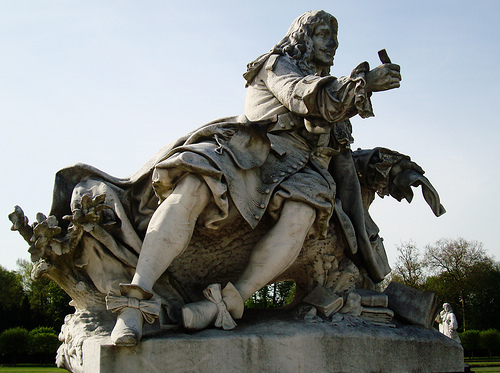 Louis, known as the Grand Condé, was a commander of Louis XIV’s armies and retired to the château in 1675 where he devoted much energy to the improvement of the park and garden. 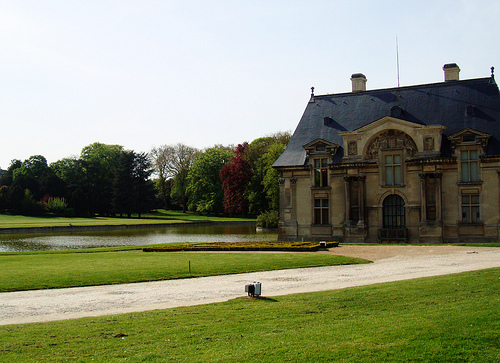 Louis’s son commissioned Jules Hardouin Mansart to rework the façades of the château. 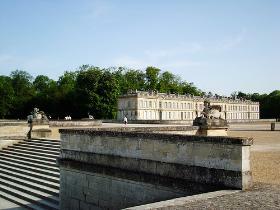 Louis-Henri (1692–1740) commissioned the monumental Louis XV-style stables which were built between 1721 and 1735 to the designs of Jean Aubert, and the small Château d’Enghien east of the great terrace. 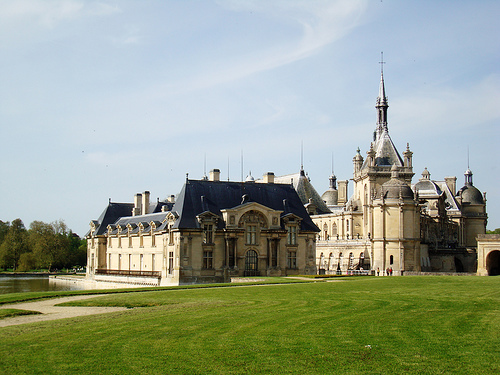 During the Revolution the château was confiscated, used as a prison and the main building subsequently razed to ground-floor level, while the park was sold off in lots. The Petit Château and other buildings survived these depredations. 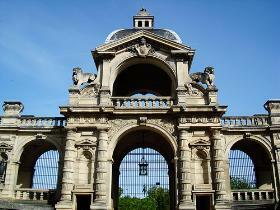 On his return from exile in 1814, Prince Louis-Joseph (1736–1818) occupied these and bought back some of the land. The present château (1875–1882), designed by Honoré Daumet for Henri-Eugène-Philippe-Louis, Duc d’Aumale, was built in French Renaissance Revival style on the foundations of the building largely destroyed in the Revolution, actually the surviving substructure of Pierre d’Orgemont’s 14th-century castle. The Duc d’Aumale died in 1897, leaving Chantilly and his collection of more than 3000 manuscripts, almost 4000 drawings and 700 paintings to the French nation. The château now houses the Musée Condé and displays important French and Italian Old Master paintings. Between 1522 and 1567 Anne de Montmorency enclosed the park, made a walled kitchen garden and created the great terrace below the château’s east front. Of these, only the terrace survives. When employed by the Grand Condé, to redesign the gardens at Chantilly (1663–1688), Andre Le Notre seized upon this feature as the fulcrum of his design. 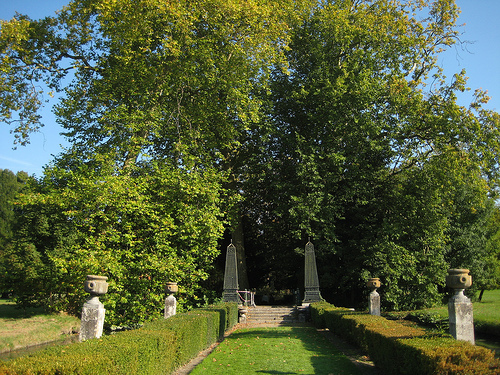 Le Nôtre was assisted by his brother-in-law and nephew, Pierre Desgots and Claude Desgots respectively, Jean-Baptiste de la Quintinie, the creator of the Potager du Roi at Versailles, Daniel Gittard, who undertook such architectural features as the terraces, garden staircases and pavilions, the engineer Jacques de Manse, the advocate Caboud, who made the celebrated flower garden, and a team of Dutch craftsmen who made the elaborate trelliswork. 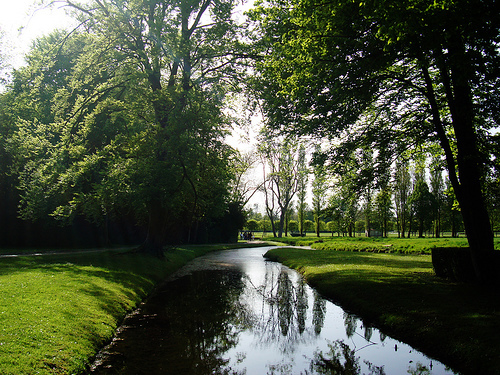 More than any other garden Chantilly Castle demonstrates Le Nôtre’s mastery when confronted with a difficult and asymmetrical site; the garden’s character is derived from the site’s abundant supply of water, which is used for its decorative value throughout. Le Nôtre’s ingenuity is still evident in the Grand Parterre and the canal, but few of the smaller features that he designed survive, due to subsequent changes and the encroachment of the town of Chantilly itself. His gardens are, however, depicted in a set of 50 engravings by Adam Pérelle , which were included in his Vues des belles maisons de France. 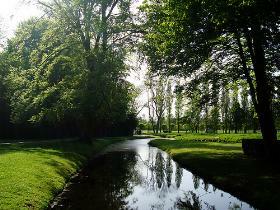 From 1773 Le Nôtre’s gardens east of the Grand Parterre were converted by Louis-Joseph, Prince de Condé with the advice of Julien-David Le Roy (from 1775) into a fashionable jardin anglais. 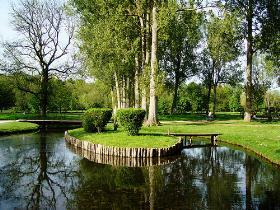 This included a mock hamlet, a group of thatched rustic buildings around a green, which anticipated the more famous hamlet of Marie-Antoinette at Versailles. 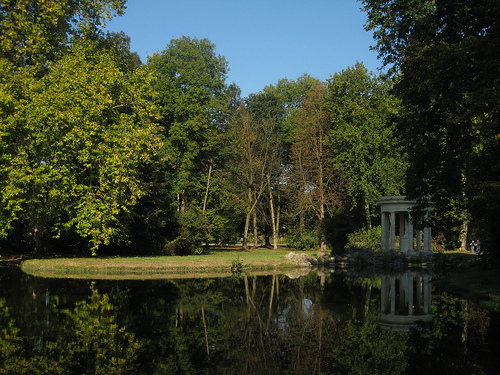 Between 1817 and 1819 the architect Victor Dubois laid out the park à l’anglaise. 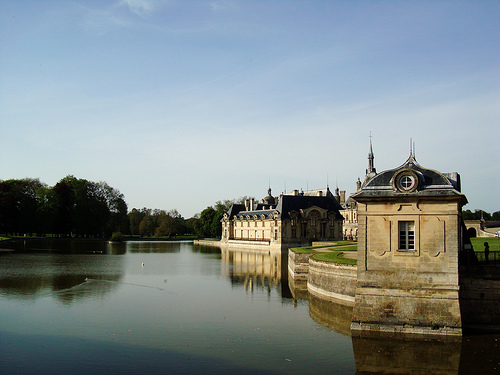 Since Chantilly Castle has been administered by the Institut de France, Le Nôtre’s Grand Parterre and canal, the hamlet and Maison de Sylvie have all been restored. The castle is closed every year in January in the following days: 3rd - 6th, 9th - 13th, 16th - 17th. Guided Tours for groups (more than 20 persons) are avaialble in different languages.